Arts & Crafts with Groups of Toddlers - Joyful Toddlers! I have a home daycare and I’d like to do arts & crafts projects, but things always seems to fall apart. Do you have any ideas of projects you can do successfully with groups of toddlers? Thanks for writing! One thing I’ve noticed working in childcare is that parents love having craft projects that get sent home. I think that it gives parents a way to visualize what their children were doing during the day, and it also can form a bridge between home and ‘school.’ So these projects definitely have their value, if you can do them in a way that everyone can enjoy. This is often easier said than done toddlers, however, with their limited impulse control, limited ability to follow directions, and limited understanding of what you do or don’t want on your chairs, floors and walls. Many projects end up with the caregivers doing 90% of the work, and the children doing lots of waiting for help. Not how you want to be spending your time! 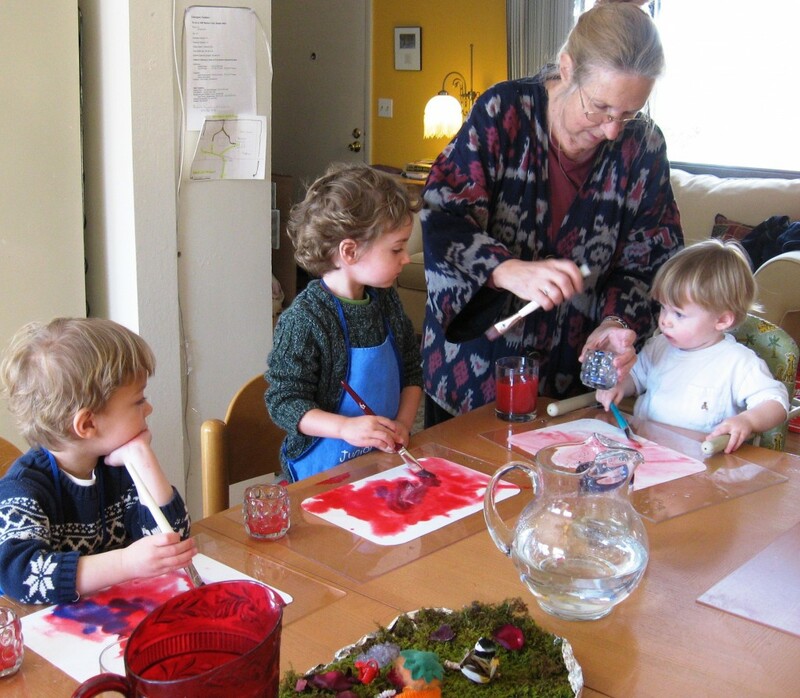 What crafts can be done successfully with toddlers, and in such a way that both the children and caregivers really enjoy it? These are ideas specifically for people working with groups of toddlers, but of course they can be done one-on-one as well. 1. Coloring is an easy craft to do. Make big coloring mats out of cotton-backed vinyl (available at most fabric stores) or by taking a quarter-inch stack of newspaper and putting a strong border of masking tape or duct tape around the edges. Use big, sturdy crayons (I like the Stockmar stick crayons best; you can find them at Three Sisters Toys ). When I have groups of kids coloring, I keep the crayons in a bowl and allow each child to pick two crayons to use. If they want to switch colors, they must put one of their crayons back in the bowl to pick another. When they are done coloring, they put both crayons back in the bowl, put their picture in their cubby, and they are free to play. 2. Baking is a project that children of all ages love. We baked all the time at Rainbow Bridge, but we usually ate what we baked. Then one day I realized it could be turned into a craft project by having each child form his dough into a shape and decorate it with raisins. I marked which was whose, and we sent them home at the end of the day. The kids were excited to show their parents, and parents were pleased to receive them. The trick to baking successfully with toddlers is to be very organized. Assemble all of the ingredients you’ll need before you start. The initial mixing parts are all about waiting and turn-taking, so I always go around the table in a circle so the children know when their turn will come. Let each child hold the measuring cup and pour in one ingredient. When you’re done, each child can take a turn mixing. Sing a short song (I use All Around the Mulberry Bush), and when the song is over, the child passes the bowl and spoon to the child next to her. After the dough has risen comes the fun part, kneading. Everyone can knead at the same time, and I knead too. You have to make your own rules about whether they are allowed to take nibbles or not, and how many. After the kneading is done, bring out the raisins to decorate, and put them on a cookie sheet. These projects bake quickly, usually 15 minutes or so. 3. Watercolor painting can be done with groups of toddlers, but it’s easiest if you have two adults present, as it needs constant supervision and can be disastrous if you’re alone and need to leave the table to help another child. If you’re determined to try it, consider having either one child paint at a time, or conversely, having them all painting at once so that everyone’s at the table. Another idea is to invite a parent volunteer to come in and help. Many parents are thrilled to be involved, if they have the time. 2. For Winter, have kids color with blue and purple, then cut the drawing into a snowflake for the child to take home. Make pomander oranges to send home. This is a one-on-one project to do with each child: attach a ribbon to the orange (you can use pins to make it stay), and then you poke a hole in the orange with a toothpick or a darning needle, and the child puts a clove into the hole. You don’t have to cover the whole orange, you can make designs with the cloves: http://www.aromatherapy-at-home.com/. Also, making snowmen with the children and dressing them in scarves and hats, with gloves on the ends of their stick arms, is fun. Parents can’t take it home, but it can be showed off and parents can imagine their child making it. 3. For Spring, of course plant things! Plant crocus and hyacinth bulbs in pots and grow them indoors. I’ve done very successful Mother’s Day gifts where the children decorated small pots, and we planted marigolds in them together. Both the decorating and the planting were done outside. We also make an Easter Egg tree with blown eggs: take a branch from a flowering tree and put it in a vase weighted down with pebbles (the kids can help with the pebbles). Depending on what climate you live in, it can be great to start with a bare branch, then watch the leaves come out, then the flowers. One by one, you can blow eggs and decorate them with the kids, either with paint and a paint-brush, or with scraps of different colored tissue paper. Just dab a drop of water onto the egg, and a child can put a scrap piece of tissue paper onto the water. Put 3-4 layers of tissue paper over the whole egg. We hang each egg on the ‘tree,’ then the day before spring break each child got to take one home. Also, growing wheat grass is easy and fun. Get baskets from a thrift store, line them with plastic (sturdy plastic wrap, or those plastic holders you put under flower pots), and put your wheat grass inside. You can use dirt or just the wheat berries by themselves; soak them overnight and don’t let them dry out. Each child can take a basket home before Spring Break. 4. For Summer, wet felting can be a very fun outdoor activity: http://www.ourbigearth.com/. We made balls and then attached ‘comet-tails’ of ribbons to them, and called them meteor balls (in Colorado August sees many meteor showers). We didn’t send them home as craft projects, but you certainly could. Hope that gets your creative juices flowing! The first key to doing crafts with toddlers (especially if you’re alone), is to think the process through and do as much work up-front as you can, gathering all of the materials you’ll need, etc. The second key is, just do one step at a time, and keep it containable. By this I mean that you may be called away from the project at any moment if a child across the room is having problems, so you need to be able to pick things up and put them on the counter if it’s something kids can’t touch without supervision. And third, don’t rush, just relax and have fun. After all, if nobody’s enjoying it, what’s the point? This article was originally written in 2010, but it never made it to my new website for some reason! Anyhow, here it is. If you are a daycare provider, I have a special section of my Tele-Class specifically for daycare providers starting on October 7th, 2012. Click here for more info.